Prime Minister Narendra Modi on Wednesday assured justice for refugees from neighbouring countries, while issuing a stern warning for infiltrators. Speaking at a public rally in West Bengal, PM Modi asserted that the Gorkha community in north Bengal won't be hurt by a National Register of Citizens (NRC). He said like Maoists and terrorists, he won't spare infiltrators too. "The way Modi has acted against Maoists and terrorists, similarly Modi is not going to spare infiltrators. On the other hand, this chowkidar would do justice to refugees who are victims of a historic blunder by the Congress," he said, in an obvious reference to the partition of the country in 1947. Modi said he had been told that rumours were being spread about NRC in the Darjeeling Hills. "I want to assure all Gorkha brothers and sisters from this stage that none of you will be inconvenienced because of the NRC," he said. Three days back, the BJP had accused West Bengal's ruling Trinamool Congress of spreading misinformation regarding the impact of the NRC on the Gorkha community in the Darjeeling Hills. "The Trinamool is running a false campaign in north Bengal through some local leaders. They are telling people that if NRC is implemented in Bengal, the Gorkhas living in the hills will have to leave the state," BJP national Secretary Rahul Sinha had said. 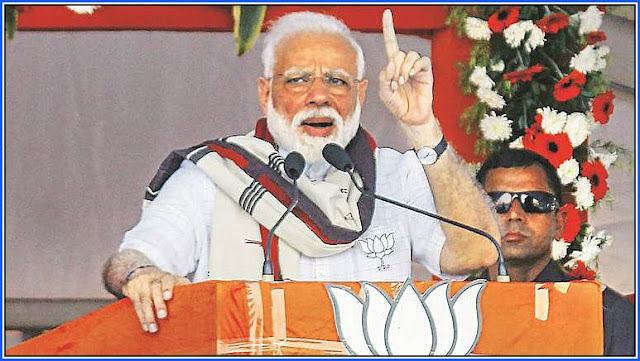 Without naming the Binoy Tamang led pro-Trinamool faction of the Gorkha Janmukti Morcha, Modi said he was warming all those "who are on the payroll of the Trinamool and spreading terror" that their days were over. "The moment the BJP comes to power, those harassing innocent people will have to answer the law." Modi said the alliance of "criminals and infiltrators" won't be able to continue for long in West Bengal and urged people to vote in the Lok Sabha elections fearlessly. "I would like to urge BJP office bearers also to hold your ground. We are with you."